(SEE UPDATE AT BOTTOM) Something you may not see in the Times-Call or any legitimate online news source is a pathetic little open letter from Longmont City Councilman Sean McCoy to U.S. Congressman Cory Gardner (copy secured through Open Records request can be found here). If I wrote that screed, or had some imbecile ghost writers put it together for me, I’d hope no one would see it, as Mr. McCoy often portrays himself as an “educator“. God help our schools. It’s so rambling and incoherent, from bringing up “Egypt’s corrupt leader” and “out-of-control capitalism“, to the Tea Party, it begs the often asked question: Seriously, is there some kind of substance abuse going on here? Do we have our own version of Charlie Sheen in Longmont politics? And after all of his antics over the last 3+ years he has the nerve to tell Congressman Gardner to “Grow up“!? He’s upset about federal funding, or lack thereof, for abortions. Like many Democrats/Liberals/Progressives Planned Parenthood should be untouchable, and us taxpayers should be forced to fund them. Is that how most of Longmont feels? He apparently wants to keep federal funding for National Public Radio. Other than helping insomniacs and furthering a mostly left-wing agenda, why should we all be forced to fund this? Campaign Finance Reform – the consistent, and appropriate, losses locally and federally just don’t sit well with Mr. McCoy. It doesn’t matter what all levels of courts say, it doesn’t matter what voters locally and nationally have to say – Mr. McCoy and his ThinkProgress/Move.On.Org pals just know better. Then Mr. McCoy dares to speak for us all, not just for his ward that equals 1/3rd of Longmont, but for all of the 4th Congressional District. This from a speaker who struggles to piece together full and coherent speeches and sentences during council meetings. He says “These are not the issues of the majority our constituents” (uncorrected grammatical error left in place – again, he’s an “educator“). Mr. McCoy may want to heed is own advice, he said: “Place the genuine needs of our constituents ahead of ideologies that drive the small and radical segments of our district, ward and nation.” Mr. McCoy is indeed part of a small and radical segment of Longmont politics. I’ll remind him the majority of voters in Longmont during the 2009 elections rejected his policies and those of his left-wing fellow travelers – it wasn’t even a close horse race. But when you have on blinders and resemble the south end of said horse – well, you get the point. Mr. McCoy should never confuse himself with “rational thinkers“, and should be the last one to point out others “personality flaws” as he did in this piece. One look at the plethora (def: overabundance; excess) of YouTube videos of Mr. McCoy should make that clear. Better yet, check out “Sean McCoy’s Greatest Fits” by our own Dave Larison. It’s obvious the fresh wounds of the 2010 election are evident all over this mentally-challenged manifesto of Sean McCoy’s. His hatred for capitalism, free markets, the military (he said “entitlement of the military budget“), the Tea Party, and his pro-life constituents is clear. 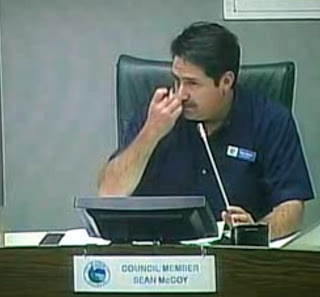 Further, his behavior as a councilman is about as embarrassing as it gets in the long history of Longmont politics. This is just further proof. Remember this come election time. Better yet, tell him about it during a city council meeting, I’m sure he’d love to hear from you – THEN show him the door come election time. UPDATE: The story gets even better. Seems that Mr. McCoy sent this letter to Colorado State Senator Brandon Shaffer, who has no connection to a U.S. Congressman. So, Mr. McCoy doesn’t even have the guts to send it to the actual recipient. This letter was also only posted on a local left-wing attack site, and according to the Word file properties its author is local left-wing mouthpiece and failed council candidate Kaye Fissinger. Apparently it took 6 revisions and over 2 hours to write this grammatical masterpiece, which includes the misspelling of Cory Gardner’s name. The linked Word document is the original sent to the city’s server received through an Open Records request, which includes all the mistakes this “educator” made, whereas the online version keeps being corrected as I point out one mistake after another – which is fairly humorous. Some obvious questions: So who actually wrote this diatribe? It was obviously done on a computer with a Word version owned by Ms. Fissinger, so it was either her computer or a borrowed Word version on someone else’s computer – or sent to Ms. Fissinger to make into a Word doc and proofread and save, showing some major ineptitude in the process. Of course, if it was sent to Ms. Fissinger, that also should appear on the city’s server or that would be a violation of Open Records law. And Mr. McCoy calls Congressman Gardner corrupt? This is the state of the far left liberal/progressive thinktank (and I use that term loosely) here in Longmont. Rank-and-file Democrats would be wise to disassociate from this crowd. Tagged Brandon Shaffer, Cory Gardner, Longmont, Sean McCoy. Bookmark the permalink. You have a great blog. Great post! We um wouldn’t want to um have people in um Boulder um think that we um can’t get along um, because um that would be um um um bad for us um.